enough vodka* to fill a Kilner jar**. *any white alcohol will do. vodka is usually recommended because it is tasteless but I've used gin. **Any recycled glass jar or 2 with a screw top lid will do. Forage berries from an area which is low in traffic fume pollution. Twelve to twenty clusters of berries ought to be plenty. 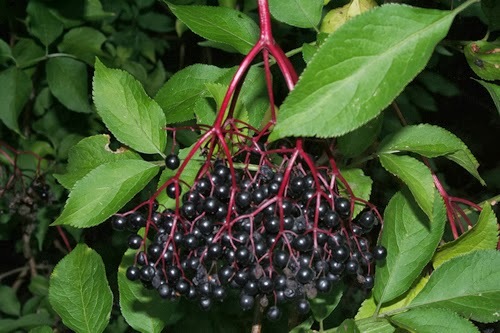 Pick from near the cluster of berries, leaving as much stem on the bush as possible. Use a dinner fork to tease the berries away from the cluster. Wash berries under cold running water. Fill jar with berries to within 3 cms / 1.5 inch of the top. Top up with vodka or other white alcohol to within 1 cm/ .5 inch from the top. Leave in a warm place for 2 -6 weeks. The longer it sits the more of the berry juices will be drawn by the alcohol. Strain through a fine sieve, ideally lined with a muslin or cheesecloth. This tincture will last at least till next year's crop of berries. A teaspoon 4 times a day at the first hint of a cold or flu bug can stop or reduce symptoms dramatically. It can be diluted in water or juice for make more palatable. Elderflower cordial is one of the best things in life which you can have almost for free. Here is a link to a no nonsense recipe and looking further into this page provides a host of other delicious things you can make with elderflower.